When I go back home to visit, I always like to pick a cheap hotels in Hong Kong island, close by my mom's house. She moved quite a bit since 1993 which gave us a lot of opportunities to discover many great cheap hotels in Hong Kong island. To learn the details and definitions of our rating system, go to our Cheap Hotels in Hong Kong page. Check back regularly for more updates of this page. If you are interested in becoming our Hong Kong hotel affiliate, fill out the form at the bottom of this page. This cheap hotels in Hong Kong island is located between Wanchai and Admiralty. About a 10 minute walk from the nearest, Wanchai station, MTR station. My uncle stayed there one time. The room is pretty spacious for the price. He loved it. a) Tram station - if you decide to take a Hong Kong Tram Tour, it is literally right across the road. b) One of the greatest Hong Kong Book Shopping places, the Cosmo, was right next to the tram rail. c) Wan Chai Wet Market is just about 8-10 minutes walk away. d) Many western restaurants, pubs and bars are next to this Hong Kong Island's cheap hotel. Or you can walk a little bit further towards the harbor front for more decent restaurants close by the Hong Kong Exhibition & Convention Centre where the Handover had taken place in 1997. You may want to check if there are some special events or exhibitions held in Hong Kong Exhibition & Convention Centre. Some of them are open to the public, such as the Book Show. Many of them are very well attended internationally. Also, I highly recommend the Congress Restaurant on the 6th floor. That is one of my favorite dining places. e) If you don't mind to walk a little bit further away from the Hong Kong Exhibition & Convention Centre, you will reach the Wan Chai Pier for a Hong Kong Star Ferry Tour or appreciate the fireworks during the Chinese New Year Tour. BOOK a room at Empire Hotel Hong Kong. Surrounded by some of the most expensive housing estates in Hong Kong, it is still on the list of cheap hotels in Hong Kong Island. Transportation is limited to buses, mini-buses and taxis. May not be the most convenient area to stay in. But the environment is good. It is about 15-minute walk to the longest outdoor escalator in the world. Through which, you can check out Dr Sun Yat-Sen Museum, former Hong Kong Police headquarters, the Soho area, Lan Kwai Fong (coming soon link to Hong Kong Lan Kwai Fong page), Hong Kong antique shopping (coming soon link to Hong Kong Antique Shopping page) and Capital of Hong Kong. BOOK a room at Bishop Lei International Hotel. Also, this cheap hotels in Hong Kong Island are surrounded by some of the most expensive housing estates. Transportation is limited to buses, mini-buses and taxis. About 15-20 minutes walk downhill to the Peak Tram Station. Of course, if you could spend that time to walk over to the station for the Peak tour, you may want to walk all the way downhill to check out the Capital of Hong Kong. If you walk downhill and towards the way to Admiralty, check out 2 of the greatest museums with free admission, Hong Kong Museum of Tea Ware and Hong Kong Seal Stone Museum. After that, you can enjoy your lunch or dinner in one of the greatest Hong Kong Chinese Vegetarian Restaurants in the same building of the Hong Kong Seal Stone Museum. Then, to walk off some calories, check out one of the greatest Hong Kong shopping malls, the Pacific Place. 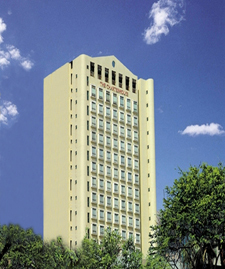 BOOK a room at The Garden View - YWCA Hotel Hong Kong. Transportation of this cheap hotels in Hong Kong Island may not be very convenient. My uncle and aunt stayed here in 2009 during their visit. They loved it. The room is very spacious for 2 Chinese whom are bigger in build than any typical Asian. After their arrival, my uncle somehow talked to the manager to get the FREE continental breakfast which he bragged about how good their food was. The Horse Racing Court is literally across the street. It would be great if you plan to watch it live. However, if you need to get in and out of the area on the day of horse racing, it may be a challenge. The bus no. 15 going to the Peak is just about 5 minute walk away. It's about a 10-minute walk to the nearest, Causeway Bay station, MTR station, 20 minute-walk to the Wet Market in Tai Yuen Street, Chinese furniture stores (coming soon link to Hong Kong Chinese Furniture Shopping page) and less than 5-minute walk for a Hong Kong tram tour. If you are willing to walk another 10 minutes, you would get to the Wan Chai pier for the Star Ferry Ride - Coast to Coast and Hong Kong Exhibition & Convention Centre where one of the most significant Hong Kong History event took place. Also, I highly recommended the Congress Restaurant on the 6th floor. That is one of my favorite dining places. BOOK a room at Cosmo Hotel Hong Kong. The location of this cheap hotels in Hong Kong Island may not be the greatest. But it's super convenient and surrounded with almost everything. About a 5-minute walk from the nearest, Fortress Hill station, MTR and tram station if you would like to take a tram tour. From where you are, I recommend to take the tram heading east of the island where the tram terminal is. Then, you can check out the Hong Kong Museum of Coastal Defence or do some Hong Kong Food Shopping. If you have limited budget on food, this cheap hotel in Hong Kong is surrounded with tons and tons of Hong Kong restaurants with absolutely affordable price and great quality. It can fill your stomach super easy and satisfy everybody's taste buds. My brother-in-law stayed here when he went to visit his fiancee. It was not bad at all for a cheap hotel in Hong Kong Island. I also went to their restaurant in the year 2000 for dinner after school. With that price, I should say that it was pretty good. Beware that there is a cheap hotels in Hong Kong island a few blocks away with a similar name which is called Newton Inn. I would not recommend this one because of it's location in the market. When you walk towards the Fortress Hill MTR station, raise your head and look at the residential development on top of it. It may not be very special because it is just a typical crowded residential corner in Hong Kong. But I can tell you that it was just a hill covered with trees about 20 years ago. I still remember the time when my mom drove us to school every morning that we passed by this same spot. There were many big construction equipments to tear down the whole place for several years. Of course, the dirt went into the sea for reclamation. This is how Hong Kong has been reclaiming its land. BOOK a room at Newton Hotel Hong Kong. This cheap hotels in Hong Kong Island is located in one of the busiest commercial areas. It is right across from the Hong Kong Arts Center and about a 15 minute walk from the Hong Kong Convention and Exhibition Center, check out our History of Hong Kong page. It used to be one of the cheap hotels in Hong Kong Island in price. It was renovated in the late 1990s and early 2000s. So, among all the Hong Kong Island's cheap hotels, it may not be "THE" cheapest. It is right around the corner of Empire Hotel Hong Kong. So, you can access literally the same things. a) Tram station - if you decide to take a Hong Kong Tram Tour. d) Many western restaurants, pubs and bars surround this cheap hotel in Hong Kong. Or you can walk a little bit further away towards the harbor front for more decent restaurants closed by the Hong Kong Exhibition & Convention Centre where the Handover was taken place in 1997.
e) If you don't mind to walk a little bit further away from the Hong Kong Exhibition & Convention Centre, you will reach the Wan Chai Pier for a Hong Kong Star Ferry Tour or appreciate the firework during the Chinese New Year Tour. BOOK a room at Luk Kwok Hotel. This cheap hotels in Hong Kong Island is right next to the North Point MTR station. Super convenient. We stayed there in 2007 because it was close to my mom's house. The price is superb. But the room is a bit small (as I mentioned at the beginning of cheap hotels in Hong Kong that most of them are like that). The bathroom's design is a bit crazy. By the time you finish a shower, the bathroom looks like it's flooded. But it's nice, clean and convenient. If you plan on traveling to Mainland China and need the traveling visa, this is the perfect place. It is just 5-minute walk away from the visa application place. Tram station is about 5 minute away towards another direction from which you can start the Hong Kong tram tour as soon as you want. If so, I recommend you to get on the tram heading towards east of the island first to go to the tram main terminal. From there, you can check out the Hong Kong Museum of Coastal Defence and a great place for Hong Kong food shopping. This cheap hotel in Hong Kong is also a block away from one of the Hong Kong Woman's Markets and Wet Market. The price in this Woman's Market may not be the greatest. But it sure gives you some ideas of what you can find in other Hong Kong Woman's Markets. The Wet Market here is much cleaner and drier than 20 years ago. I came here every day to do grocery shopping before and after my mom had my youngest sister. I was 11 then. At that time supermarkets were much smaller in scale, not to mention chain stores. Although supermarkets sell almost everything, produce in the Wet Market is much fresher and has more varieties, in my opinion. If you have limited budget on Hong Kong food, you can also find a lot of affordable Hong Kong domestic restaurants here, especially food hawkers where you can try so many great varieties that you may not find anywhere else. The choices of restaurants may not be as wide as in the area close by the Newton Hotel Hong Kong. Do you like Chinese opera? There is a theater over here that you most probably pass by when you head over to the tram station. This is THE place for all the Chinese opera performers and fans go to watch the show. I went there once in 1992 to watch one Chinese opera with my grandma. It lasted for 4 hours. Unfortunately, I was and am not the fan of Chinese opera. I slept for at least 3 hours. But the ticket was almost HKD500 back then. It was and still is very expensive. BOOK a room at Ibis Hong Kong. We were in this Hong Kong mid-priced hotel in 2003. We picked it because of its location. a) Tram station - if you decide to take a Hong Kong Tram Tour, it is about 10 minutes walk from the hotel. c) Wan Chai Wet Market is just about 15 minutes walk away. d) Many western restaurants, pubs and bars are right across the bridge. Or you can walk to the opposite direction towards the harbor front for more decent restaurants close by the Hong Kong Exhibition & Convention Centre where the Handover had taken place in 1997. You may want to check if there are some special events or exhibitions held in Hong Kong Exhibition & Convention Centre. Some of them are open to the public, such as the Book Fair. Many of them are very well attended internationally. e) If you don't mind to walk a little bit further away from the Hong Kong Exhibition & Convention Centre, you will reach the Wan Chai Pier for a Hong Kong Star Ferry Tour or appreciate the fireworks during the Christmas time or Chinese New Year Tour. Next to this Hong Kong mid-priced hotel, it is the Hong Kong Arts Centre where I used to take my drawing lessons on the 20th floor for 3 years in my childhood. Right across the street, it is the Hong Kong Academy for Performing Arts. If you look for some unique Hong Kong entertainment, you should check out these 2 places. They have art exhibitions, drama, Chinese opera, orchestra and many more. When we were there, the services were awesome that Perry and I were very happy about it. We were also lucky enough to have a partial harbour view room. This is an elegant hotel, conveniently located at the edge of Causeway Bay. The Hong Kong Convention and Exhibition Centre and Causeway Bay MTR subway stations are within easy walking distance of the hotel. The majority of tourist attractions and business areas are easily accessible within 10 minutes drive. It is just a 10 minute walk to one of the best malls in Hong Kong, the Pacific Place Mall, check out our Hong Kong Luxury Shopping page. Plus, it is surrounded by many different restaurants. Many choices of cuisines. Walking towards the opposite direction of the capital of Hong Kong, you can do some fashion shopping with super, super low price. You will also pass by a Hong Kong market in Wan Chai. If you are interested in some traditional Chinese furniture (coming soon - link to Hong Kong Furniture Shopping page), it is on your way, too. It is about a block away from the Empire Hotel Hong Kong, another great and cheap hotel in Hong Kong Island. So, you can access literally the same thing. But the tram station for the Hong Kong Tram ride and one of the greatest Hong Kong book shopping places are right there. You just need to take the elevator to get on the ground floor from your room. BOOK a room at the Wesley Hong Kong. We stayed in this cheap hotels in Hong Kong Island in 2001. The staff was very helpful. The Chinese restaurant over there served great food. It is about a 15 minute walk from the nearest, Causeway Bay, MTR station. But if you walk over to the MTR station, you may want to check out the greatest shopping area, such as the market the Times Square Mall and other great places in the area, check out our Hong Kong Shopping page. The tram station is less than 5-minute walk away if you want to jump start the Hong Kong tram tour. The Hong Kong Victoria Park is another 2-3 minutes away from the tram station. If you come to Hong Kong travel during the Chinese New Year, make sure to check out the flea market. There are also events that take place in the Park during Mid-Autumn Festival. When we were kids, our parents used to take us there on the Mid-Autumn Festival night with our lanterns. It was awesome. And don't forget to check out the Fire-Dragon Dance a couple nights before the Mid-Autumn Festival as well. It is about 10 minutes of walk away from this cheap hotels in Hong Kong island. A bus terminal is 5 minute away from you that helps you to get to so many places easily, such as the Floating Restaurant, the Jumbo (coming soon link to the Jumbo Floating Restaurant page). The Hong Kong Stadium is about 15 minutes away. Check out if there's any live concert or soccer game over there. In summer time, there are always world well-known soccer teams coming to Hong Kong playing over there. My sister and I went for this kind of events so many times. We watched AC Milan from Italy, Hot Spur from Britain and many, many other live concerts. When I was in elementary school, the school sport competition was held there once. The stadium condition was terrible. But it was re-constructed in 1994. My whole family even went to the live concert for the grand opening. It was SUPERB. On the way to the Stadium, you will walk passed a high school, hospital and church. That is one of the top 100 schools in Hong Kong that every parent would dream of. When it comes to Hong Kong food, this cheap hotels in Hong Kong island is just located at the perfect place. You can eat super cheap with great quality. You can also eat ridiculously expensive. You can literally eat any kind of cuisine within 15-20 minutes of walk around you. Are you a book lover? Less than 10 minutes away is the Hong Kong Central Library which is the biggest Hong Kong public library. It may not be as big as any other public library in some main cities in the world. But you can find a lot of books over there. The only setback of Hong Kong libraries is that there is always 2-3 years of lag of time. If you want to find the latest publications of books, you may be disappointed. But there are many old publications that you can't find in any bookstores where you can find them here. Every book cover in the Hong Kong public libraries is altered to be hardcover. The size and content of the book is never changed. But the way how they do it definitely preserve the book for longer period of time from damage. BOOK a room at the Rosedale on the Park Hotel Hong Kong.